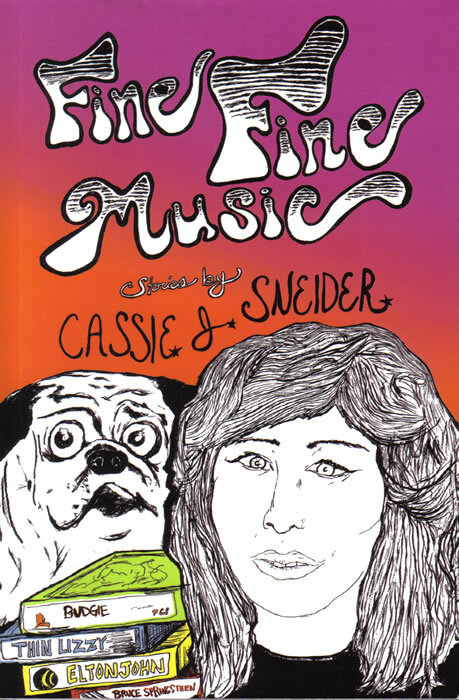 Fine Fine Music is a collection of stories about the other side of rock and roll and coming of age in the land that time forgot. Lake Ronkonkoma is stuck in 1981, an alcoholic blackout of unnatually tan people waxing their Camaros to Foreigner on cassette and knowing the words to every Billy Joel song whether you want to or not. 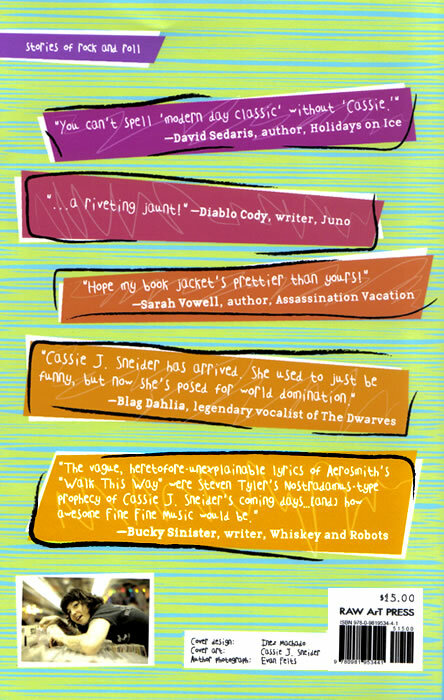 From an internship making Seamonkey costumes, a childhood fear of My Buddy dolls, and a heartbreaking crush on Aerosmith, funny lady Cassie J. Sneider delivers her tales of growing up in a land of fist-pumping Snookies with the antagonistic wit of a record store clerk. The poems in Beyond Midnight put our everyday experiences in a new light with language that leaves us wanting more. A solid collection by a poet who keeps breaking through barriers of language and content: Think of it this way, words skid over the stillborn silence,/an arrow pierces the red morning/as the raven wakes free. Publisher's note: What I Want From You straightforwardly establishes an instant connection of attention and questioning. What is wanted? The what is the doorway between the poet and the reader. 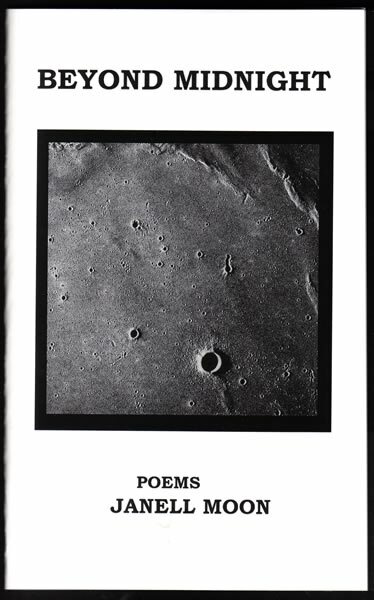 These poems establish that connection at the level of desire, the heart, of struggle...at the level of living. I felt enlivened by the voices of these women living within their own identity, without qualifications or comparisons to external criteria. To live one’s own life from the center of oneself is the heart of liberation—no matter that liberation is a constant struggle from moment to moment. For me, having the privilege to work with these poets was to experience each poet’s light burning and to know it was not reflected light. 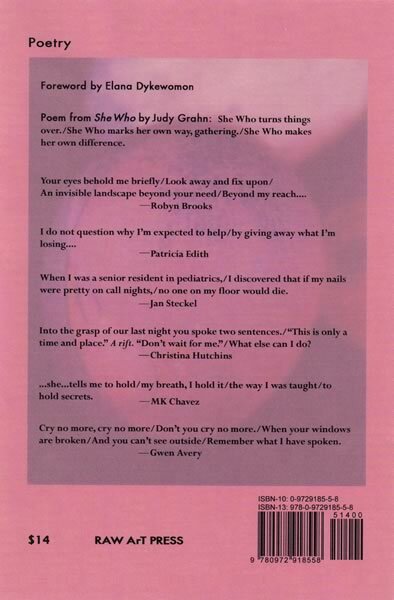 I am heartened to know I am surrounded by such a vibrant community of free-spirited, strong women ready to follow their own internal spirits—we are, as in Judy Grahn’s powerful poem, She Who continues. 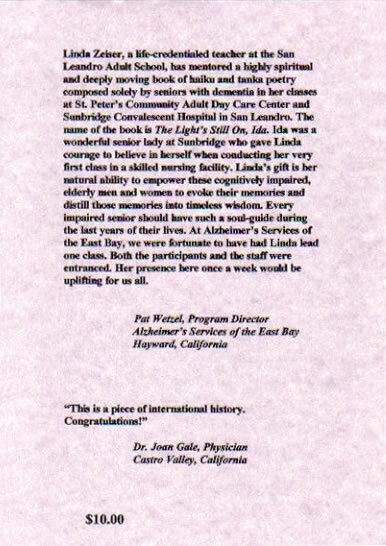 Linda Zeiser received a grant from the San Leandro Chamber of Commerce to put a book of haiku and tanka together with sayings from her Alzheimer's students. This book, The Light's Still On, Ida, has gone into its second printing. 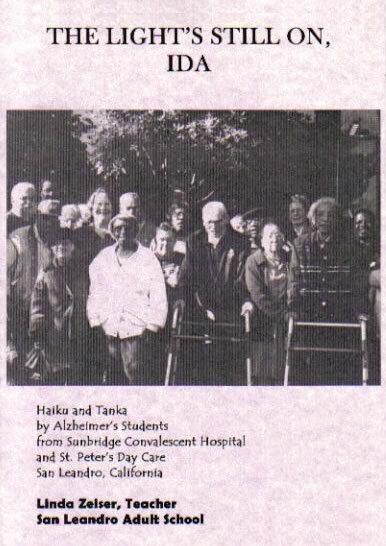 The poems are uplifting, full of gratitude and wisdom, a book to give caregivers hope—to be read and reread. 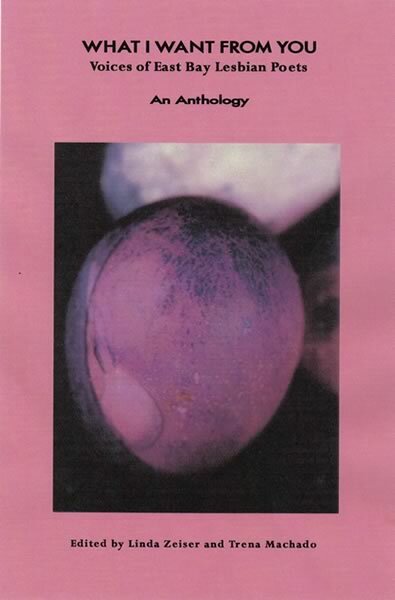 To purchase books, please contact Raw ArT PRESS.